Responsive Web Design Looks great on all Devices. Responsive web design (RWD), adapts itself to the size of the screen used to view a website. Simply put, the site resizes itself accordingly to the size of the device, from desktops, tablets and smartphones. And of course, responsive web design is mobile-friendly. 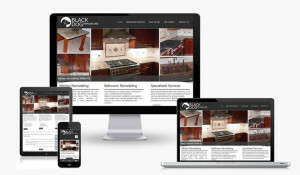 With the constant increase of mobile device usage, it is imperative that any business adapts its website to the demand. You need to be where your customers are. Moreover, if you have a responsive website and your competitors don’t, you will stand out and stay ahead of the game! 70% of mobile searches lead to online action within 1 hour. 55% of conversions (phone call, store visit or purchase) from mobile search happen within 2 hours. The average smartphone user spends more than 2 hours a day on their mobile device. 74% of mobile users say they will not go back to a non mobile-friendly website. Smartphone search volume in the US. Mobile search volume has now surpassed desktop search volume according to Google. Responsive Web Design equals more Customers. Most people searching on their phone, will leave a website if it is not mobile-friendly. They will go on your mobile-friendly competitors’ websites. Non-mobile-friendly websites are very difficult to use, navigate and read. No one likes to resize, scroll and zoom in and out to be able to see what is on a screen. 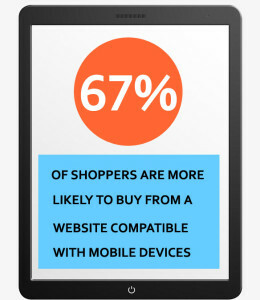 If you have a brick-and-mortar business, it is important that your website be mobile/responsive. People search on their phone, locally when they are on-the-go. They search for “best pizza near me”, “dry cleaner near me”, “gluten free bakery near me” are just a couple of examples. Google will show websites that are geographically close to the searcher, and of course are mobile-friendly . The importance of responsive web design is pretty obvious. Moreover, Google rewards responsive websites with more traffic/potential customers. Convert a Website to Responsive Web Design. Designing a second website for smartphones is one solution, but not the best. You will have two separate websites and urls, one for desktops and one for smartphones. You will need to maintain and optimize both, which is time consuming and expensive. Furthermore, your visitors will see the desktop website version on tablets, which is not the most user-friendly. This is the better solution and as we’ve already said, Google recommends it. You will have only one website to maintain and optimize. Your website will look modern and will be up-to-date with the latest web design technologies. Moreover, responsive web design will adapt itself to future screen sizes, whatever they will be. Ultimately, you will get great return on your investment. Responsive web design is a must for any successful business. Google has been recommending it for a while now. You will be ahead of your non-responsive competitors. You will get more traffic and potential customers. Please feel free to reach out if you need more information and/or if you are ready to talk about your responsive website project! If you have a website and are not sure if it is mobile-friendly, take the Google’s Mobile Friendly Test. You also read more about mobile-friendly websites.